Winners, We Have Winners! Harvest Inchies! Happy Thursday! I want to continue with the Alcohol Faux Bleach/Batik Tutorial today. If you were at the Chicago or York Stamp Show, you saw me work with acrylic fragments and alcohol ink. That is what I want to walk you through today. 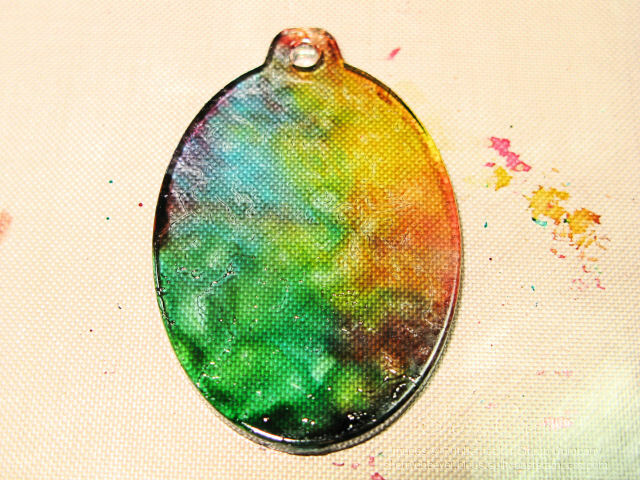 I’ll also show you the finished project, which is a tag made with alcohol inks using the faux bleach technique. I really think this one needs a different name, but I just haven’t settled on what. I am leaning toward calling it – – – oh I don’t know! It is a variation of the faux bleach technique that I have been playing with so it might as well be Alcohol Faux Bleach. 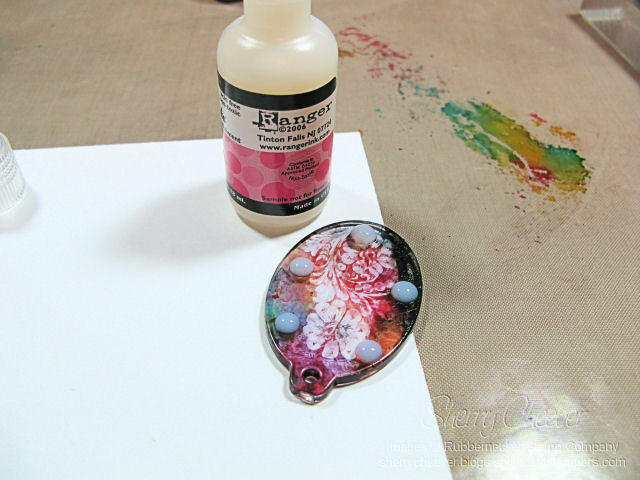 Let’s get started by inking up your felt applicator with the alcohol inks. I have used cranberry, butterscotch and stream. 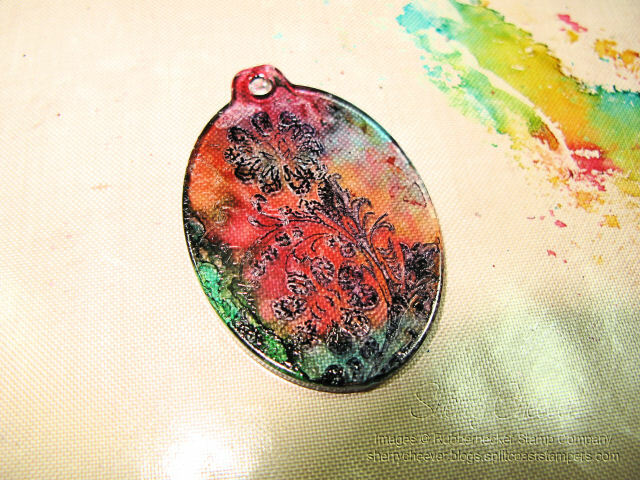 Apply the inks onto the fragment, letting the alcohol ink dry in between layers. You will end up with a fragment that looks similar to this. Let the ink dry thoroughly. 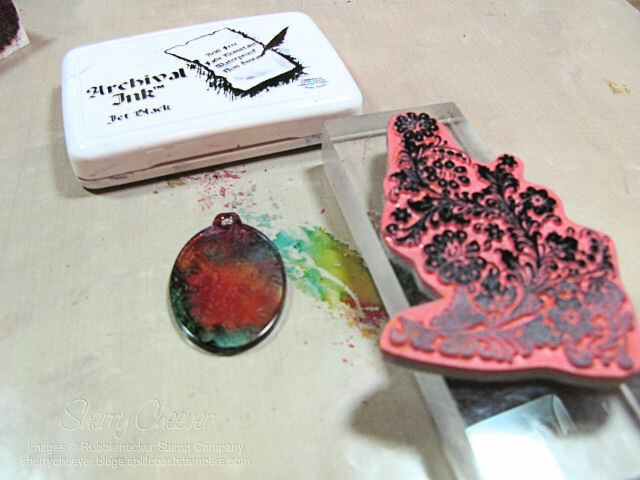 Choose an image (not words or sentiments) that you would like to stamp on your fragment. Ink the image with a permanent black ink. I have used Ranger Archival Jet Black. 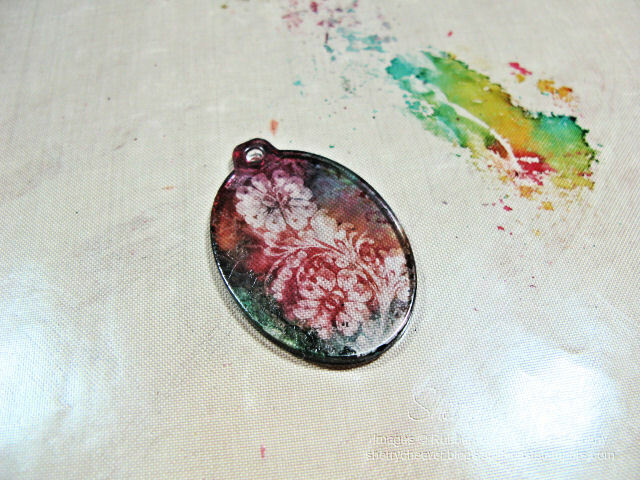 Stamp the image over the alcohol ink that you applied to the fragment. Using a gentle touch, immediately wipe the black ink off with a cloth. You should now have a fragment that has a clear image of the one you stamped. Trim the image and you will now have an embellishment ready to use on a card, or anything else you would like to use it for. For mine, I used the fragment as an embellishment on a tag. 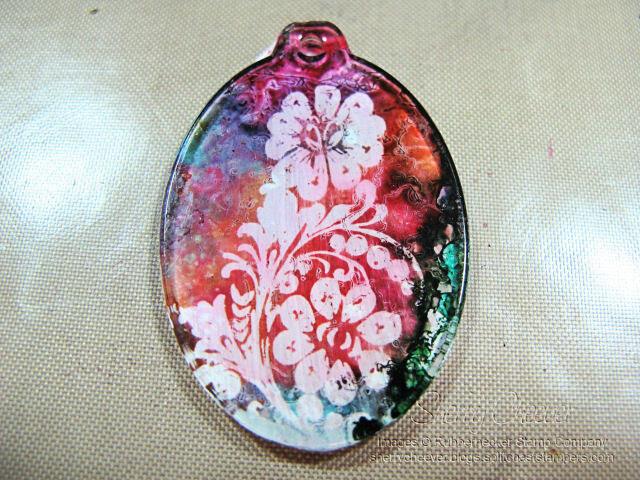 Using the faux bleach/batik technique described in the first installment of this tutorial, I created a tag using alcohol inks. 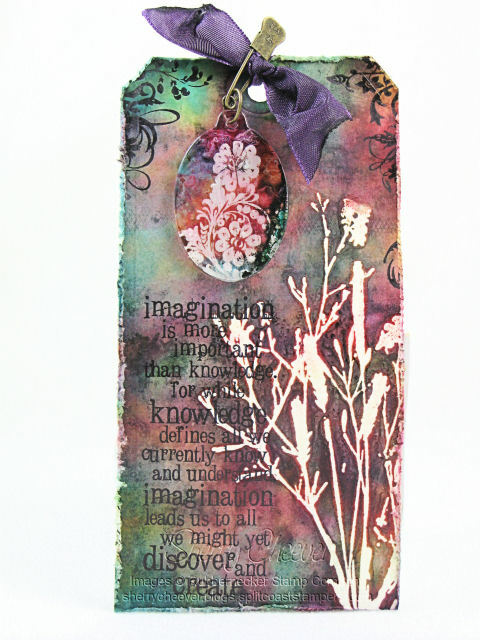 The tag, unlike glossy cardstock, absorbs the alcohol ink and gives an entirely different look than that of glossy cardstock. 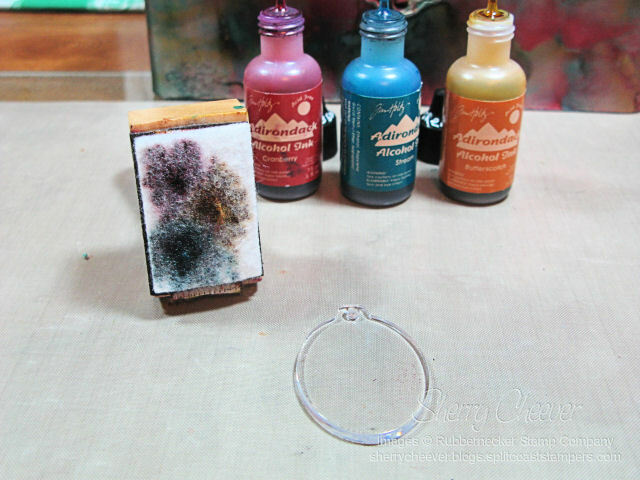 I can’t wait to see all of your alcohol ink projects! This is beautiful Sherry. Thanks for the tutorial. Nice job! Sherry, the accent looks beautiful on the card. Hope that the local Michael’s sells the fragments; I’m ready to try another new technique 🙂 Hope you enjoyed a super duper birthday and that the weather was as nice as it is here in northern Virginia. Sherry..this is my favorite thing that you have ever made. This is awesome!! Tim taught you well…lol!! Love the way this turned out!! when you wipe off the PERMANENT black ink – why does it wipe off if it’s permanent and why doesn’t the alcohol ink around the image wipe off too??? Can you explain or have I misread the directions? This is a real jaw dropper. Exquisite. Thank you so much and FYI — I absolutely love shopping at Rubbernecker. Thanks so much for introducing me to this wonderful site. OMG, Sherry! This is the most beautiful tag I’ve EVER seen!!! I’m drooling on my keyboard!! Sherry ~ what a stunning piece of art!! Thank you so much for making the time and effort to put together your wonderful Tutorials over the past two days 🙂 I just got through printing them off to insert into my collection of new and innovative items I wish to try. I’ve never seen this technique using Tim’s fragments but plan on attempting it soon. You seriously need to start framing and showcasing your work so everyone can enjoy it, including the pups! Wow Sherry, this is just beautiful! Thanks for sharing, your tag is just gorgeous! This is awesome! I’m working with Dave in the booth this weekend and so hopefully this is one of the demos we will get to do. Love it! Absolutely gorgeous! Have some alcohol inks but never opened them. Here’s my inspiration. Thanks for sharing. Thanks so much for this tutorial. This is amazing!! Super cool, Sherry…thanks for the great tutorial!!! Your tag is AWESOME!!! Beautiful!!!!! I just picked some fragments up the other day and this seems like a fun technique to try with them. What an artista Sherry! I love the piece and the tag. Gorgeous art! Great tutorial ! I was at the stamping convention in York, Pa. last weekend and saw you do this technique. As a matter of fact my daughter-in-law and I sat across from you and had a nice visit while having lunch on Saturday. I’m just getting to try out this technique. I thought I remembered you spritzing some water on the fragment after stamping the image on it but don’t see that step in the this tutorial. Does it work either way? Thanks for your help and I hope your soldering is working out. Love how this technique turns out. The acrylic fragment turn out gorgeous. I am going to have to try this! Thanks for the Great Technique Sherry! 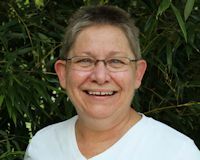 Great technique, Sherry — love the look! Awesome tutorial…thank you so much for sharing..love the samples.